A LOCAL community group is launching its online documentary series later this month at the Inishowen Maritime Museum in Greencastle. Inishowen Community Media Network (ICMN) has been working on a digital media project, Croí na Farraige – Heart of the Sea, to tell the story of the peninsula’s rich maritime heritage. The series looks at the current state of our once-thriving fishing industry and way of life, told through the life stories of locals who made a living from the sea. The project also looks at ways in which our coastal communities are fighting back and diversifying to continue to make a living from the sea. ICMN spokesperson Martha McCulloch said that they were delighted with the response from the local community, many of whom came forward to tell their stories. "Some of those who feature in the series spent a lifetime at sea and some of the younger contributors are trying to make a living from it. The idea behind the project is to document material for future generations that would otherwise be lost. All the recorded material is being archived and will be free for the public or schools and libraries to use for research or promotional purposes, e.g. Greencastle Maritime and Dunree Museums." To view ICMN’s YouTube channel click here . The videos feature a wide range of subjects including the Foyle Fishermen’s Co-op, the oyster-farming Kearney family from Carndonagh, Seamus Bovaird and the Greencastle Maritime Museum, Andrew Ward of the IDP, Owen Doyle from BIM, old seafarers Johnny Kelly and Jim Cavanagh and younger men like Gerard Kelly and Cara Rawden. These are all sea-folk with stories to tell, some nostalgic, some sad and some with hope for the future. The short videos uploaded to date can be viewed on ICMN’s YouTube channel . 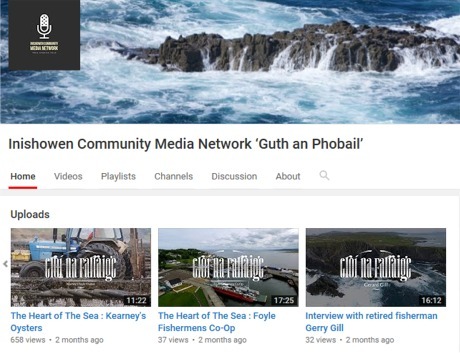 Inishowen Community Media Network commissioned Crana Communications to research and produce the documentary series. Production began in October last year and the crew had a busy time interviewing and visiting locations throughout Inishowen in the months since then. Jim Doherty of Crana Communications was keen to point out that the project is far from over. "What we have produced and uploaded so far is only the tip of the iceberg. We have a lot more content to add to the archive." Anyone wanting to get in touch with ICMN can email them at guthanphobail@gmail.com or call 086 8156289.